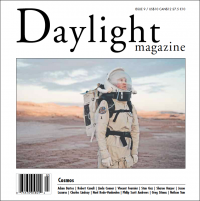 Daylight Magazine is an English-language documentary photography magazine founded in 2003 by Taj Forer and Michael Itkoff and published by the Daylight Community Arts Foundation. Released bi-annually, each issue features a series of selected photographs related to the issue's theme with explanatory essays written by the photographers. The magazine is progressive in outlook and portrays the effects of larger forces and trends on individuals, communities and landscapes.